Postmodern Jukebox is back … Back in Black & White! The band’s nonstop throwback carnival is on the road again with their Back in Black & White Tour, kicking off this fall. PMJ has always been about using modern media to turn back the clock to a time we always imagine in shades of black and white — simpler, more carefree, without so many mind-boggling devices and distractions, every one streaming in hi-def at any hour of the day! Of course, live entertainment was always live and in vibrant color, so PMJ offers fans the best of both worlds. PMJ shows bring a full band of gifted musicians, with a cast of favorite singers and tons of surprises, to a city near you. As any PMJ fan can tell you, the experience is never the same twice, with new songs and shifting combinations of members giving a unique twist to every show. PMJ looks forward to bringing their unique spin on modern pop hits and retro pop stylings to new cities for the first time while revisiting favorite haunts that feel more like home each time around. The multi-talented collective reimagines contemporary pop, rock, and R&B hits in the style of various yesteryears, from swing to doo-wop, ragtime to Motown — or, as creator Scott Bradlee himself puts it, “pop music in a time machine.” Started by Bradlee in 2009, PMJ has gone on to amass more than 950 million YouTube views with 3.3 million subscribers, and have chalked up more than 1.5 million likes on Facebook. The band has performed on “Good Morning America,” topped iTunes and Billboard charts, caught the attention of NPR Music and NBC News, and played hundreds of shows to sold-out houses around the world. For those who only know PMJ from their time-warping videos, the live show is an experience on a whole other level. It’s a Roaring 20s party that would make the Great Gatsby proud, mixed with a swinging 60s night with the Rat Pack, spiced up with a little Motor City soul and some classic sock hop rockin’ that gets the audiences twisting or twerking the night away — depending on what era their mood is in. 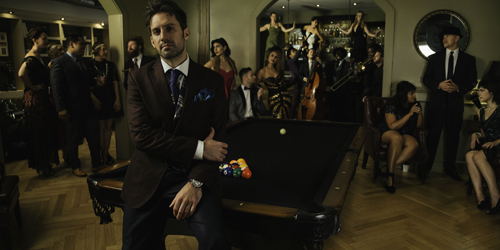 A Postmodern Jukebox tour is a unique blend of talents and personalities that makes for a show that’s always entertaining and consistently fresh and exciting.